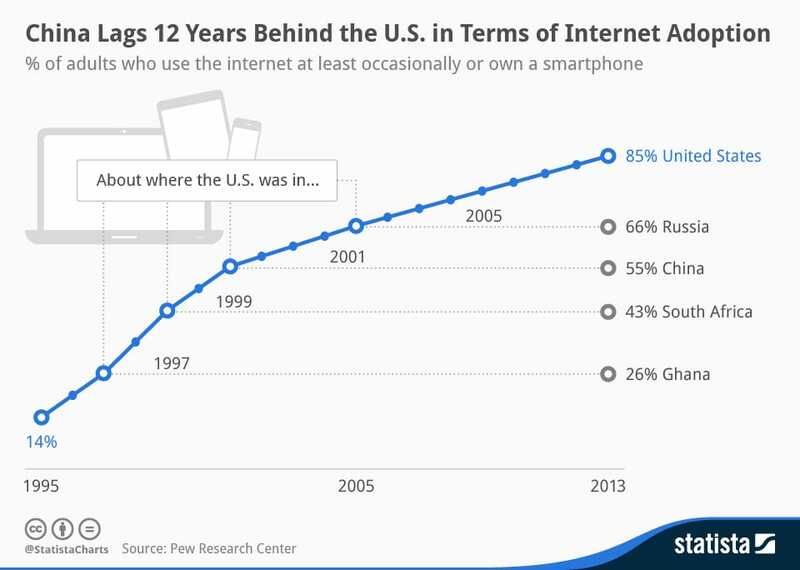 The folks at Statista Charts just released this highly relevant one about Internet adoption in China compared to the United States, showing that China is about 12 years behind the US. Since arriving in Hong Kong, where the state of the Internet is considerably more advanced, I’ve come to the conclusion that Asia in general is about 10-12 years behind when it comes to the adoption of SEO. While many companies in Asia have jumped on the paid search/PPC/Adwords bandwagon which provides instant results and instant gratification, the investment in organic SEO, which provides a much higher long-term ROI, has been minimal at best. However, this shouldn’t deter companies in Hong Kong and China from making that investment. If anything, the fact Asia trails the US means the opportunity is only that much more ripe for the companies that act the soonest and move the fastest. China may be 12 years behind in Internet adoption, but they are catching up fast, adding more users faster than the US ever did. Likewise, companies in Hong Kong and China can catch up in terms of SEO and other online marketing tactics to enhance their marketing strategies, and they can do it in a matter of a few years, if not several months. The key is to start today.